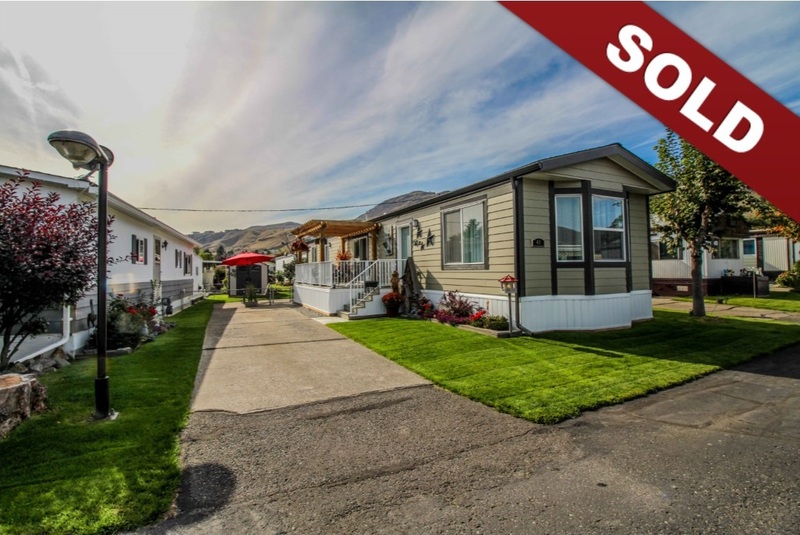 New Listing: 41-2400 Oakdale Way, Westsyde, Kamloops, BC $172,000. Beautiful 1.5 year old home in a popular park located in the 55+ section. The owners of this home made very careful choices with all the finishings throughout this home. The main space features an open floor plan with vinyl plank flooring throughout, vaulted ceiling, crown moulding throughout, modern paint colours, numerous windows including a bay window and upgraded light fixtures. The kitchen features stainless steel appliances, many cabinets for storage and lots of work space. There is a closet off of the main entry. There is access to the nice sized patio off of the kitchen and it has a custom made pergola. There are 2 good sized bedrooms, a 4 piece main bathroom and a 2 piece ensuite. Other features include central a/c, wide hallway and doors to accommodate a wheelchair or walker, fully fenced yard with storage shed, beautifully landscaped yard and parking for two vehicles. It is nearly impossible to get a new home in this location! Pets allowed with restrictions.